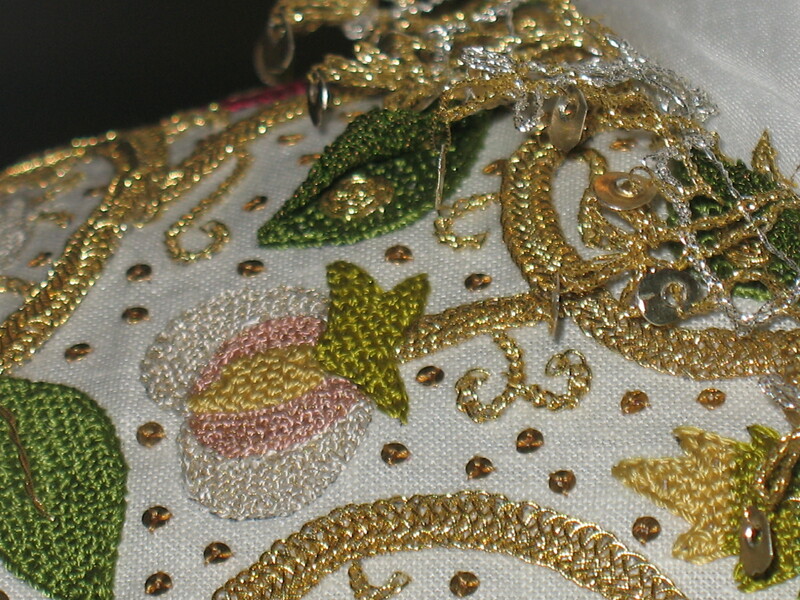 Once I got into the rhythm of the Queen stitch, it moved along nicely. And, I am getting used to using a magnifying glass. Although, it does get warm being that close to the light. Glad I have a fan & AC. I have to give my 51 year old eyes a break though! I also find the chart is aligned to threads more than holes. So, I have not figured out how to count to the next flower yet. I think I was tired & will try looking at it again when I am fresher. 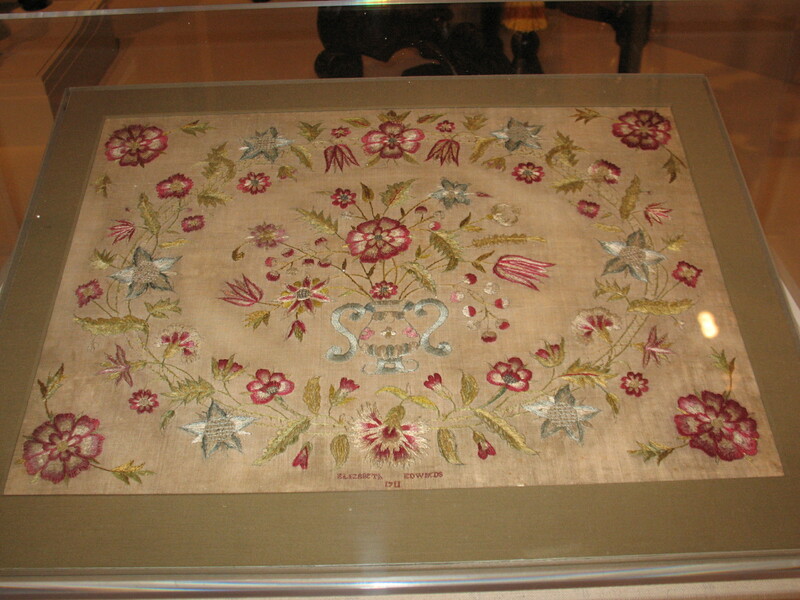 Over the past weekend, I enjoyed an afternoon at the Winterthur. The tram took us on a tour of the grounds of the DuPont estate. There are some colors from flowers but the various green plantings are in abundance. The attention to details is amazing. 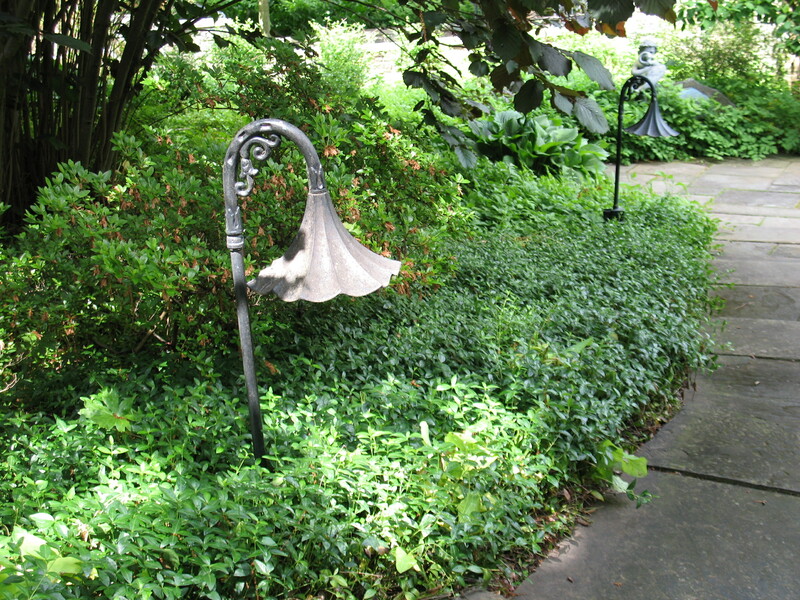 For example, the lights along the walkway (left photo) are functional & ornamental. 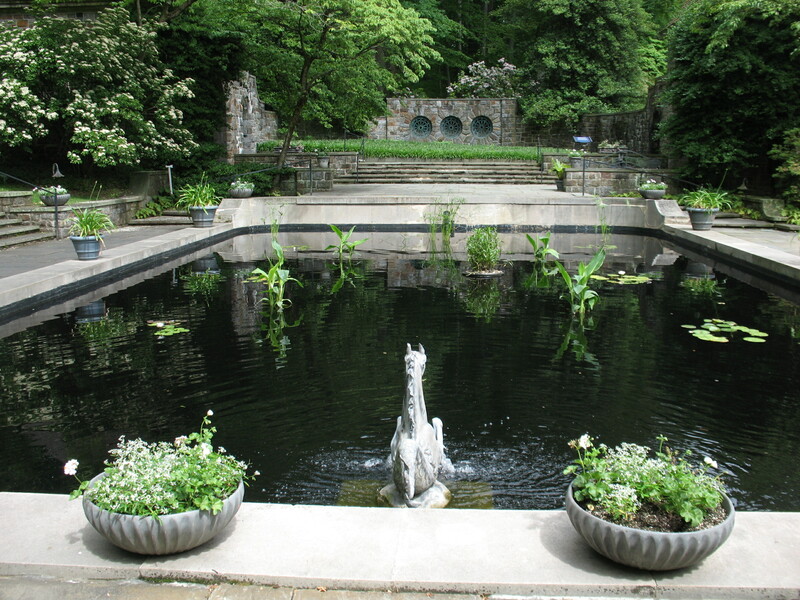 The reflecting pond (right photo) was originally a pool & the first in the US to be heated. At the far end (right photo), those 3 round grates are covering 3 huge speakers through which the guests could enjoy music as the lounge about the pool! Moving indoors, nice small groups of 10 were given an hour tour of several rooms in the mansion. Then, we were free to walk the property, through the galleries & browse the Campbell Soup tureen collection. 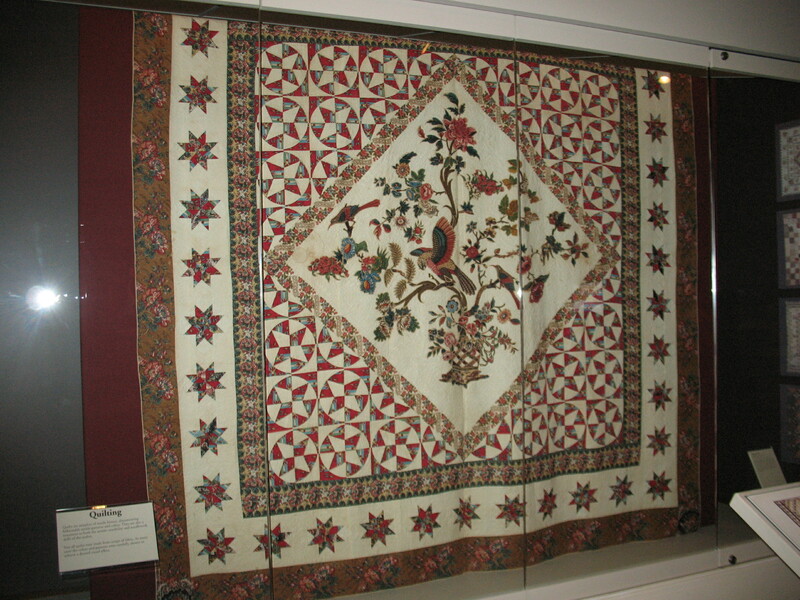 Their textiles are extensive, including samplers, needlepoint wall hangings, quilts, drapes, bathroom towels, chair covers, book covers, table cloths. Tailor-made tours are available at an extra charge. 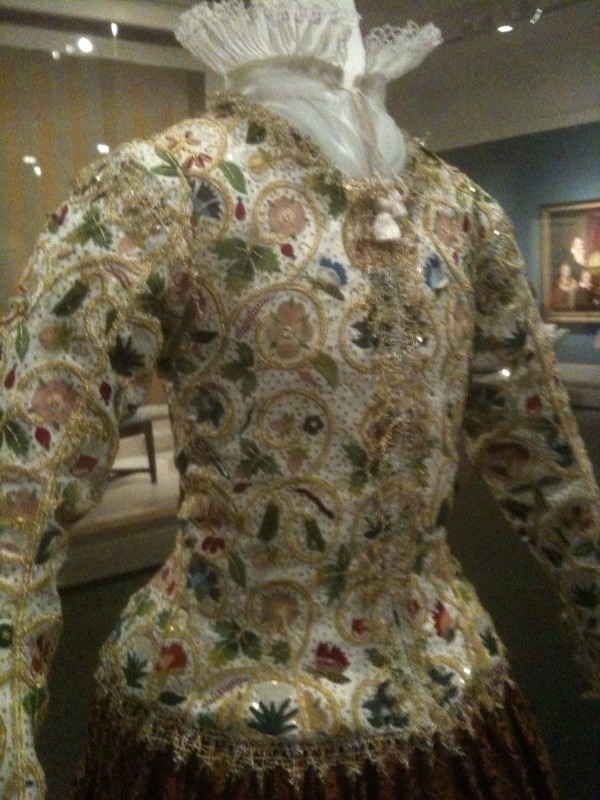 And, of course, the Plimoth Jacket. It is stunning in person. Kept behind a plexiglass but in the middle of the floor so you can walk all around it. There is a brief video about the making of the jacket. Quite interesting. 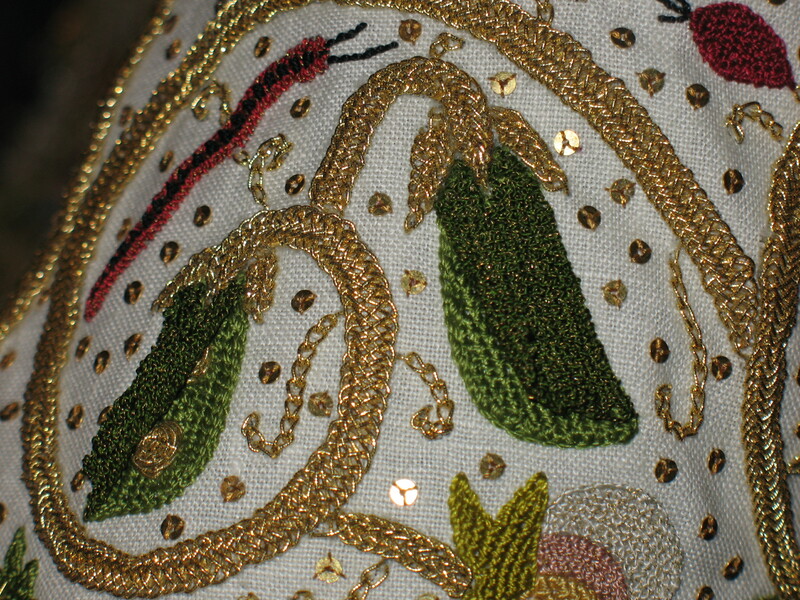 They even sewed over the seams – such attention to detail. 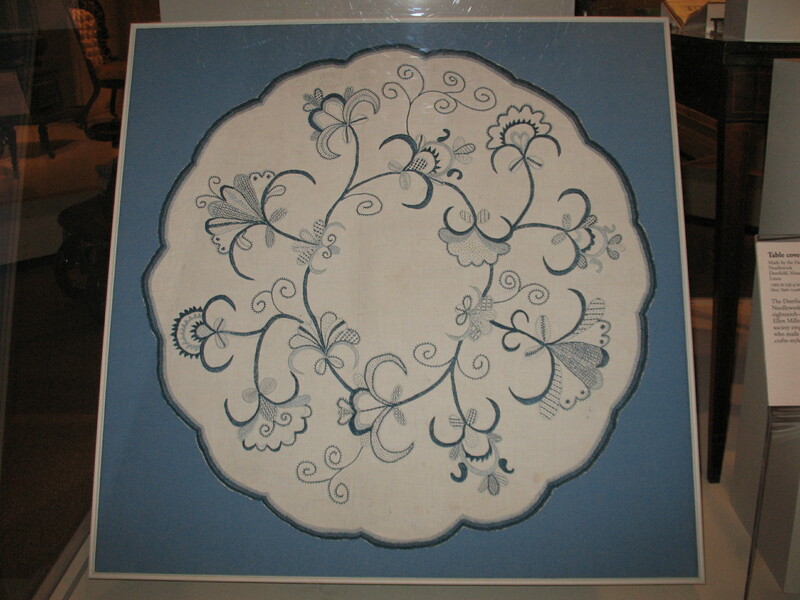 FYI: Winterthur didn’t mind pictures being taken of anything. 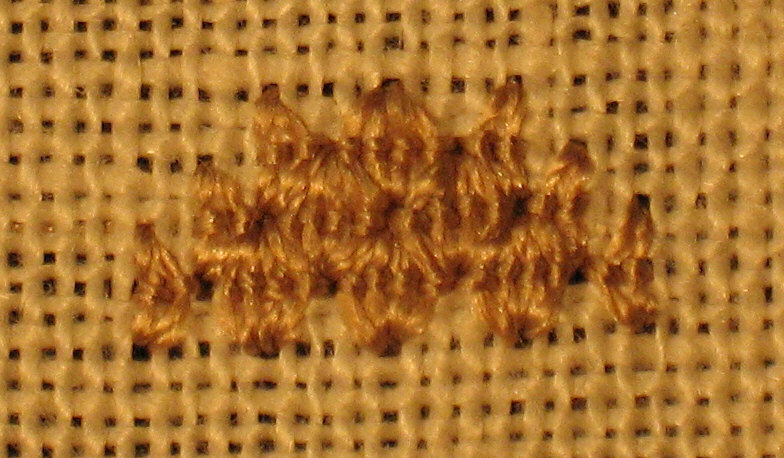 Well, I got the scroll bars, attached the linen to the scroll bars, & started stitching for the sampler Tudor and Stuart Gold Master Class by Thistle Threads. Lesson 1 of an 18-month class. I had to get my magnifying glass out of the closet & attach it to my light stand so I can see b/c 32 count is soooo small. 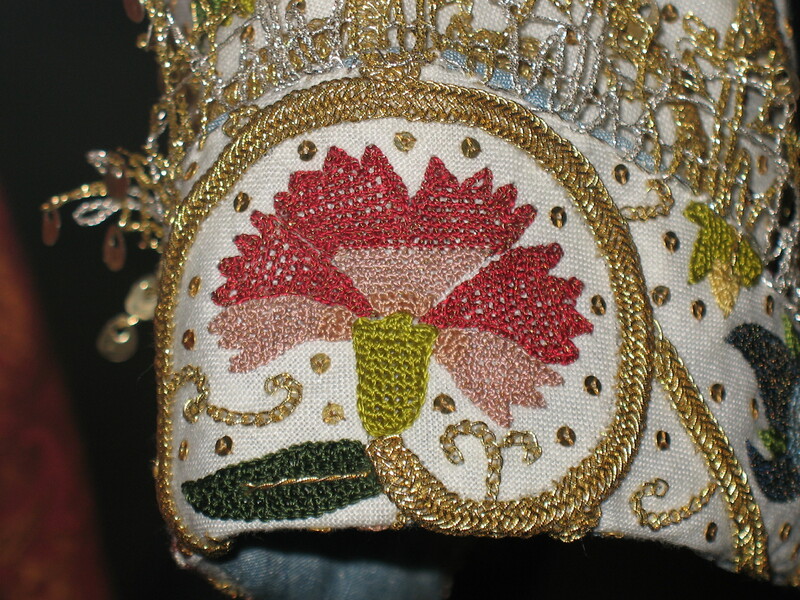 I got the top of the center flower done (6 full & 3 half queen stitches done). 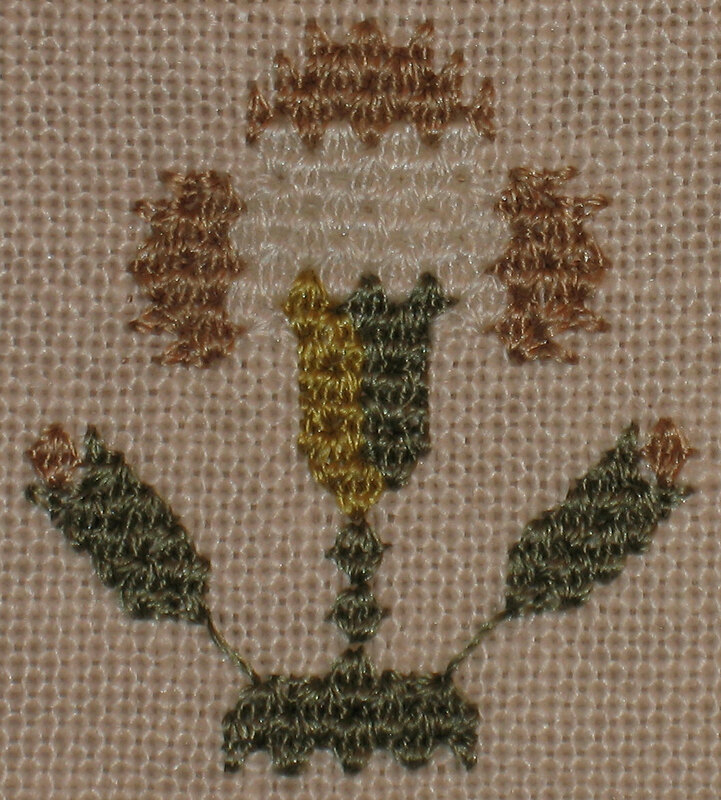 Not a difficult stitch – I’ve used it before – it’s called Rococo in The Needlepoint Book by Jo Ippolito Christensen. But it’ll take time getting used to using a magnifying glass as I work. 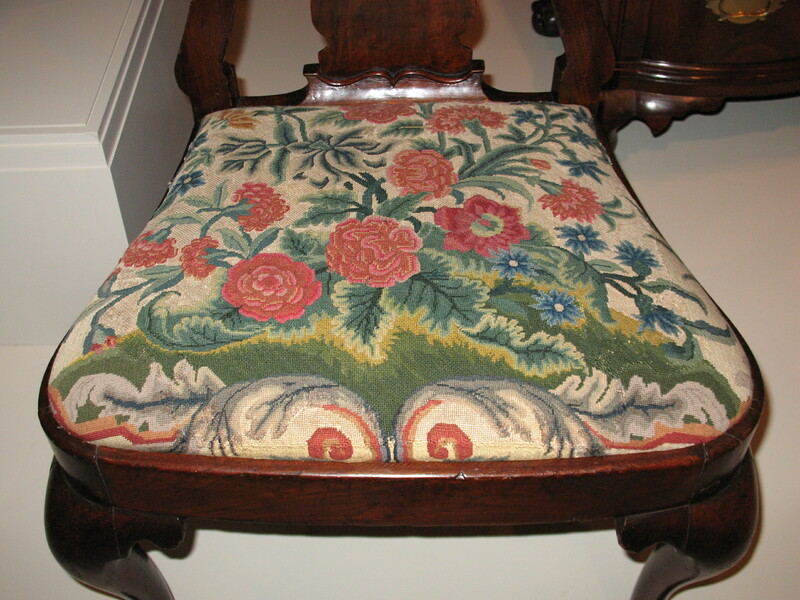 Betsy contacted Winterthur & they said, “You can use your own photos and post on a blog! Thanks so much for spreading the word, and also thanks so much for asking!” So, here are her photos of the jacket & a headpiece. Thanks for getting permission Betsy & providing the photos. 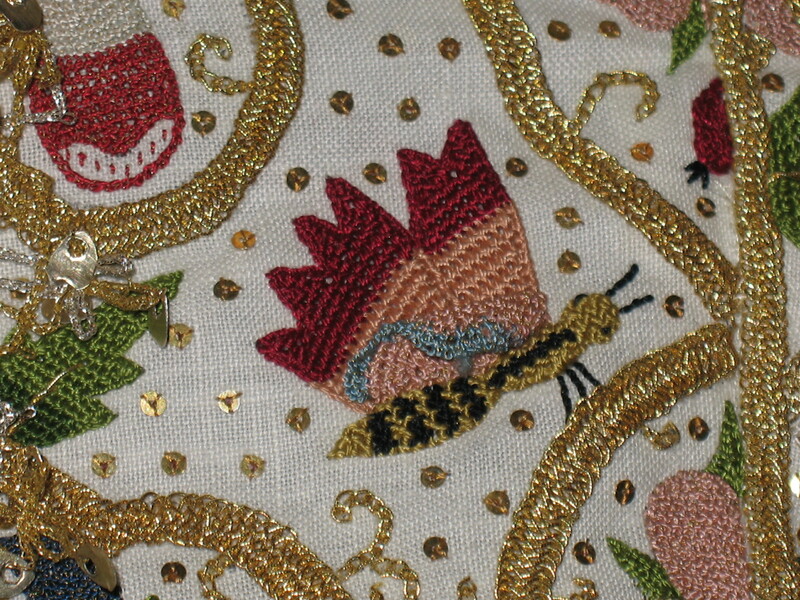 Thanks (I think) to Winterthur, the Plimoth Jacket, & Betsy, a fellow ANG Mainline chapter member, I can’t pass on the opportunity & challenge of the class, Tudor and Stuart Gold Master Class offered by Thistle Threads. The Winthurer, located in Delaware, has been on my list to visit. 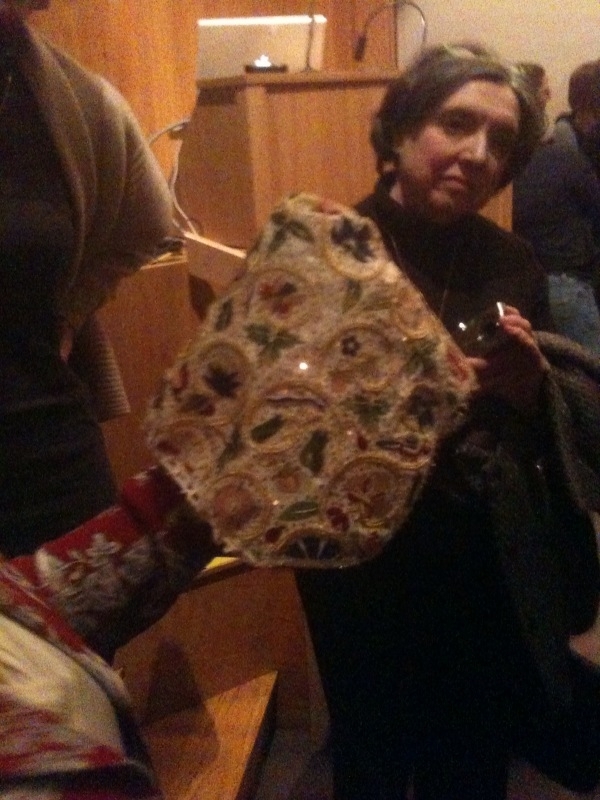 Betsy has spoken so highly of the Plimoth Jacket, a collaborative effort from hundreds of people of all ages. It is absolutely gorgeous from the photos I’ve seen. And, for each of the 32 stitches taught there will be traditional line drawings to follow & animation to watch – a most impressive technology! I think I’m still talking myself into it even though I already registered. Betsy signed on too! It’s an 18-month class (registration ends March 31).